Boron is believed to be involved in carbohydrate transport in plants; it also assists in metabolic regulation. Boron deficiency will often result in bud dieback. Copper is a component of some enzymes. Symptoms of copper deficiency include browning of leaf tips and chlorosis. Iron is essential for chlorophyll synthesis, which is why an iron deficiency results in chlorosis. Manganese activates some important enzymes involved in chlorophyll formation. Manganese deficient plants will develop chlorosis between the veins of its leaves. The availability of manganese is partially dependent on soil pH. Molybdenum is essential to plant health. Molybdenum is used by plants to reduce nitrates into usable forms. Some plants use it for nitrogen fixation, thus it may need to be added to some soils before seeding legumes. Zinc participates in chlorophyll formation, and also activates many enzymes. Symptoms of zinc deficiency include chlorosis and stunted growth. 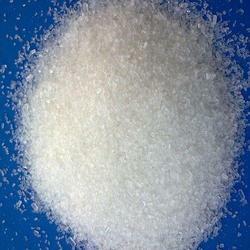 We are one of the leading Manufacturer and Exporter of Zinc Sulphate. Zinc sulphate is a colorless crystalline, water-soluble chemical compound. Zinc Sulphate is prepared by reacting zinc with light aqueous sulfuric acid. It can be used as a spray dying material. First the main application is as a coagulant in the production of rayon. 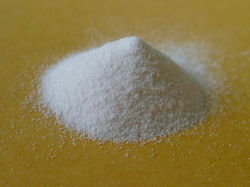 Zinc sulfate is also used to supply zinc in animal feeds, fertilizers, and agricultural sprays. Zinc sulfate, like many zinc compounds, can be used to control moss growth on roofs. Furthermore it can be used as in electrolytes for zinc plating, as amordant in dyeing, as a preservative for skins and leather and in medicine as an astringent and emetic. Magnesium Sulphate Monohydrate is an inorganic chemical compound comprising of magnesium, sulfur and oxygen. It is most commonly found in the form of MgSO4.H2O which is also called Epsom. Magnesium Sulphate Monohydrate is used as a firming agent, nutrient additive, and flavour enhancer. It functions as a fermentation aid for the processing of beer and beverages. · As a pigment- Manganese white. Zinc Sulphate Heptahydrate. It is in a form of white crystals . Magnesium Sulfate is composed of magnesium and sulfur, both of which are necessary for healthy plant growth. In plants, magnesium is an essential mineral nutrient for effective crop Development. Magnesium acts as a catalyst for many enzymes and plays a significant role in photosynthesis, metabolic pathways, nucleic acid formation, phosphate transformation, chlorophyll and protein synthesis. Sulfur also assists in chlorophyll production and makes nitrogen, phosphorus and potassium found in the soil more effective. Magnesium Sulphate Fertilizer makes for a good enhancer in agriculture, improving plant nutrition and overall crop yield. We supply two forms of Magnesium Sulphate Fertilizers: flour and granular. Magnesium and sulfur, two naturally occurring minerals that are major components of Epsom salt, may help plants grow greener with higher yields and more blooms. Magnesium creates an environment conducive to growth by helping seeds to germinate, increasing chlorophyll production and improving phosphorus and nitrogen uptake. Sulfur is also a key element in plant growth, helping produce vitamins. · Magnesium in Agriculture: The Magnesium sulphate Heptahydrate is widely used in agriculture as a secondary nutrient for giving chlorophyll effect to the plant. · Magnesium in Cattle feed: Magnesium Sulphate acts as laxative in the animal feed industry. · Magnesium in Industries: Magnesium Sulphate is also used in various other industrial applications namely Textile, Detergents, Paper, Ceramica, Refractories, Polymers etc. · Magnesium sulfate heptahydrate is also used to maintain the magnesium concentration in marine aquaria that contain a large number of stony corals as it is slowly depleted in their calcification process. · Highly soluble in water and glycerol. · Sparingly soluble in alcohol. · It uses with Chemical Fertilizers as well as also directly given to the crop by sprinkle. 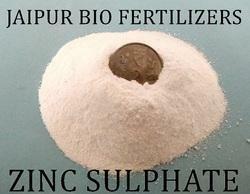 Ferrous Sulphate Heptahydrate is a Micronutrient fertilizer. 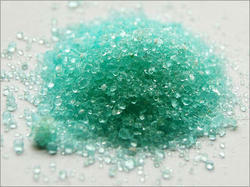 It is a blue green crystalline powder. 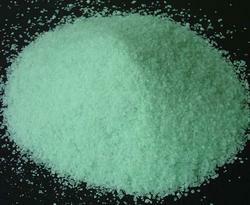 Ferrous Sulphate Heptahydrate is commonly called iron sulphate, green vitriol, or copperas. Ferrous Sulphate Heptahydrate can be also prepared by reacting iron with sulphuric acid. It removes the deficiency of iron micronutrient in plants. Plants uptake iron in its oxidized forms, plants use various iron uptake mechanisms. One of these is the chelation mechanism the plant releases compounds called siderophores which bind iron and enhance its solubility. This mechanism also involves bacteria. Another mechanism involves the release of protons and reductions by the plant roots, to lower pH levels in root zone. The result is increased iron solubility. · It is used as a lawn conditioner, and moss killer. · The sulphate acidifies the soil and promotes fine leaved grass growth. · High alkaline soil hurts grass growth. · Controls unwanted moss that ruins the appearance of your lawn. · Reduces that chance of turf disease. DOSAGE: - 10 gm/1litre water. Copper sulphate enriches the soil and provides an essential nutrient to growing plants. When soil is copper-deficient, young plants may develop chlorosis, a condition in which leaves yellow due to lack of chlorophyll. Young plants in very nutrient-deficient soil may simply die. Wilting, lack of flowers and reduced fruit harvest are all likely effects of copper-deficient soil. Copper sulphate prevents these problems. 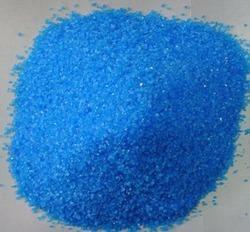 Regularly apply copper sulphate as needed in a spray or fertilizer preparation. · Preparation of Bordeaux and Burgundy mixtures on the farm. · Control of fungus diseases. · Correction of copper deficiency in soils. · Correction of copper deficiency in animals. low input & high efficiency product to provide overall heath for soil/plants/crops. 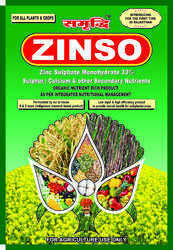 ZINSO contains Zinc, Calcium & Sulphur which are essential plant nutrients. Zinc present in ZINSO is important for maximizing leaf and vascular growth, increasing plant root growth and promoting a massive root system. These fortified roots help increase nutrient uptake and water-use efficiency for overall plant growth. Sulphur present in ZINSO helps in activating enzymes responsible for increasing oil and protein content in Oilseeds/ Pulses (Legume Crops). Calcium present in ZINSO activates different enzymes for cell division and is essential for stability of cell membrane, which boosts the overall growth and health of the plant. It improves the soil pH and helps in build-up of soil microbial biomass. ZINSO Increases water-use efficiency of crops, which is extremely important during a drought. It activates the uptake of major and minor nutrients trapped in the soil. It Improves soil porosity and water holding capacity resulting in good soil tilth (the condition of tilled soil) and texture. ZINSO helps to keep phosphorus and other nutrients from leaving farm fields. ZINSO leaches down to the subsoil and results in increased root growth. Ultimately it enhances the yield and quality of final crop. ZINSO also improves the ability of soil to drain and not become waterlogged due to a combination of high sodium, swelling clay and excess water. ZINSO increases bio-availability of Zn, Ca & S.
ZINSO is in POWDER FORM and is suitable for application in all plants/ crops. USAGE: ZINSO needs to be applied as basal application into soil at the time of sowing or can be top dressed at the first time irrigation in all plants/crops. We are one of the leading Manufacturer and Exporter of 33% Zinc Sulphate Monohydrate. Zinc sulphate mono hydrate is a colorless crystalline, water-soluble chemical compound. Zinc Sulphate Monohydrate is prepared by reacting zinc with light aqueous sulfuric acid. It can be used as a spray dying material. 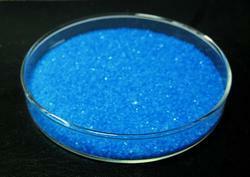 · Copper sulphate is used as a fungicide, algaecide, root killer, and herbicide in both agriculture. Ferrous Sulphate Monohydrate for Agriculture is extensively used in agriculture sector and it is highly effective in nature. It is also used as fertilizer in the agricultural industry. Ferrous sulphate helps to growth and resistance in plant diseases; it also increases the immunity in plants. Ferrous sulphate monohydrate is a very economical fertilizer used for the treatment and prevention of the iron deficiency in plants, which also control the calories in the plant. Manganese is a micronutrient that is commonly deficient in soils with a pH level above 6.5. When your plants are lacking of this mineral, they exhibit visible symptoms. For example, beans and many non-grain crops develop yellow or white areas between the veins of the leaves. To remedy this, you can apply manganese sulphate, which is one of the most common fertilizer sources of manganese. You can choose to fertilize with manganese via a soil application or foliar spray. · It is one of the important trace element fertilizers can be used as base fertilizer. · Can promote the growth of crops to increase production. · It is used as feed additives..
· It is used in the production of raw materials & the manufacture of other manganese salt materials. · It is used in ceramics, fungicides, and medicines. Zinc Sulphate Agriculture Grade. It is in a form of white crystals. We are one of the leading Manufacturer and Exporter of Zinc Sulphate Monohydrate Agriculture Grade. Zinc Sulphate Monohydrate Agriculture Grade is a colorless crystalline, water-soluble chemical compound. Zinc Sulphate Monohydrate is prepared by reacting zinc with light aqueous sulfuric acid. It can be used as a spray dying material.